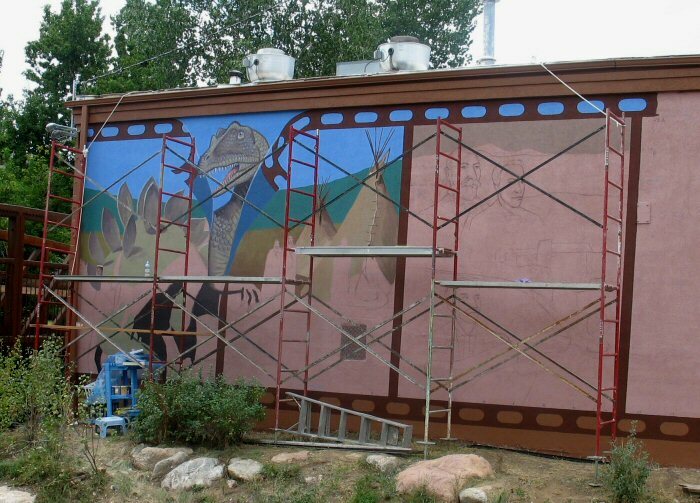 Note: This retrospective, originally published on the Lariat Loop’s blog, captures the process of creating the historic mural in downtown Morrison. On the east side of the TnT Country Kitchen, the mural faces Two Creeks Park at Mt. Vernon Creek and the interpretive kiosk. Original post dates are provided below. Click any photo for a closer view. The mural was well underway by August 2007. Dinosaurs and Indians take shape on the first two panels, as a sketchy George & Isabel Morrison wait in panel 3. By late September 2007, the mural had progressed into recent decades. Our mural in downtown Morrison has reached modern decades, 150 million years from its first panel. In the panel on Red Rocks Amphitheatre, Emanuel gets started with Jerry Garcia and Jimi Hendrix. 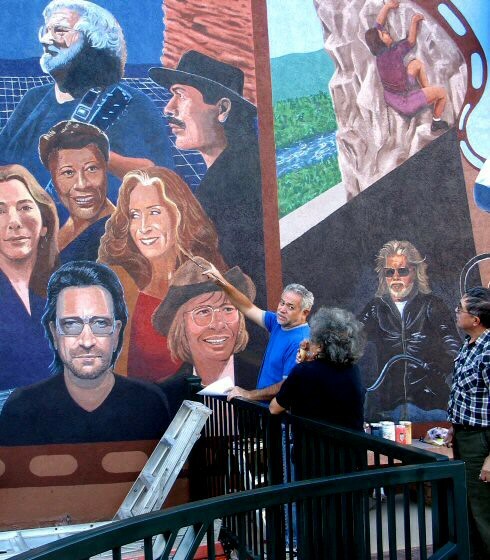 Artist Emanuel Martinez is now at work on the fifth panel, depicting stars from Red Rocks– from Ella Fitzgerald to Jerry Garcia. The latter, he tells us, is attracting a lot of attention to the project. There’s little doubt the concert panel will become the most popular of the six depictions of Morrison’s history, from dinosaurs to rock ‘n roll. 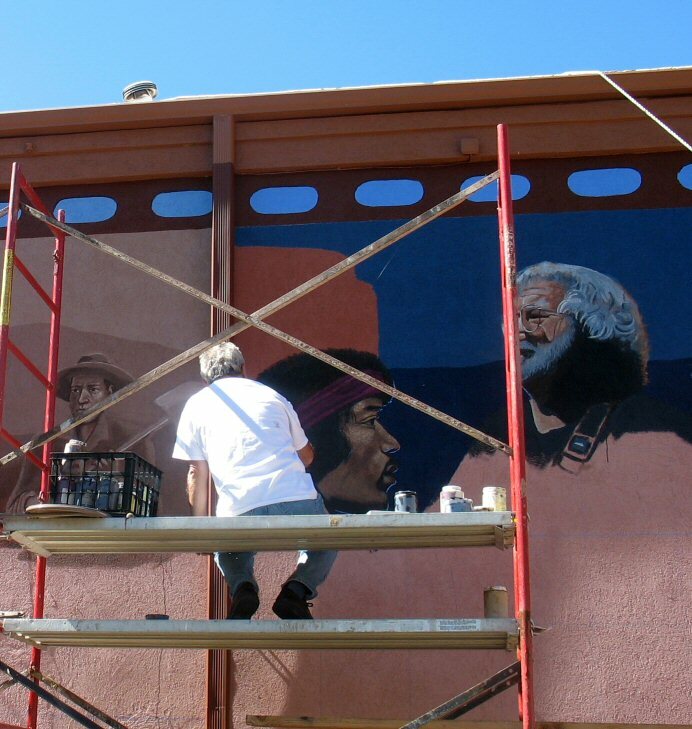 Here, Jerry Garcia and a CCC worker from 1930s Red Rocks keep a watchful eye while Emanuel works on Jimi Hendrix’s afro. 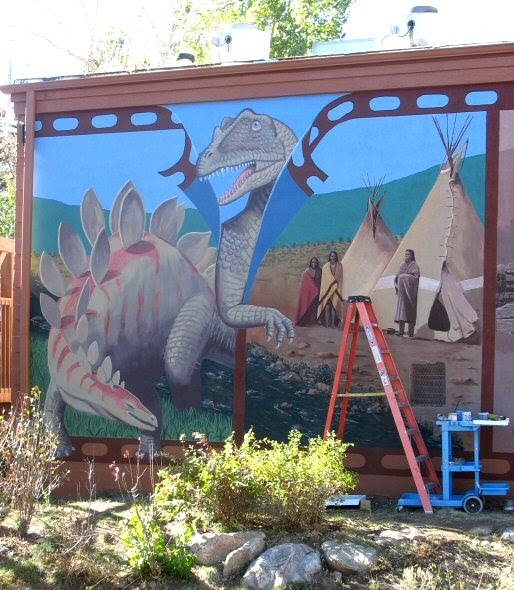 Panels 1 and 2 recall Jurassic era prehistory and Native American use of the area. 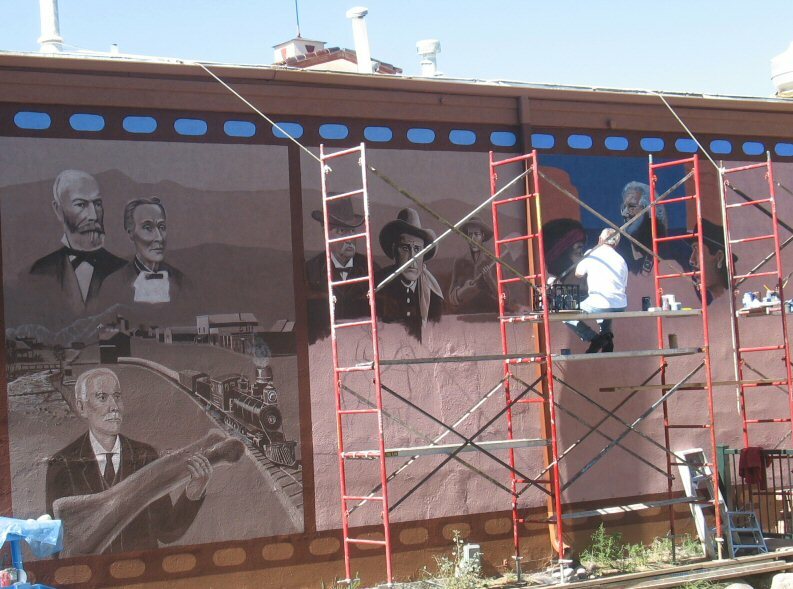 The historic mural by Emanuel Martinez, commissioned by the Lariat Loop Heritage Alliance, is now finished. Last week, Emanuel put a few finishing touches on the early panels, including Morrison’s famous dinosaurs shown here, and ended his work on the last two panels. During his work on the Morrison mural in September 2007, Emanuel pauses to discuss his project with admirers who stop by. Noted performers from Red Rocks are a real attraction, with passersby often stopping to talk with Emanuel while he worked, as here. His image of Bono, of the band U2, is especially striking. Later this fall, an interpretive panel identifying the characters and stories in the mural will be mounted on the wall at the lower right. This project was funded by grants from the Federal Highway Administration (Colorado Byways program), the Lariat Loop Heritage Alliance, Denver Theatres and Arenas, the Friends of Dinosaur Ridge, the Morrison Natural History Museum Foundation, Karin Bond, and Jeanne and Cy Esphahanian. An interpretive sign posted nearby provides information on each of the mural’s six historic scenes.